We are so happy to tell you that on December 10th these 5 Beautiful f1b petite mini Goldendoodles were born! Based on their 19 pound mini Goldendoodle mom and 18 pound mini Poodle Dad we expect this litter of puppies to be 14-24 pounds fully grown. This sweet little litter of petite mini Goldendoodles has been a joy for us to raise. They are fun-loving, kind, and have some of the sweetest personalities! we are sure that they will make great new friends for a few very lucky families! Nena is a friendly puppy with a cheerful spirit. She has gorgeous thick black coat that is as soft as silk! She is a very pretty puppy that will love to spend time with you. She is loving, gentle, and super smart! Nico is a sweet little guy that plays super well with his siblings. He is a calm little Goldendoodle with a very soft handsome coat. He is also very affectionate and will be a wonderful companion! 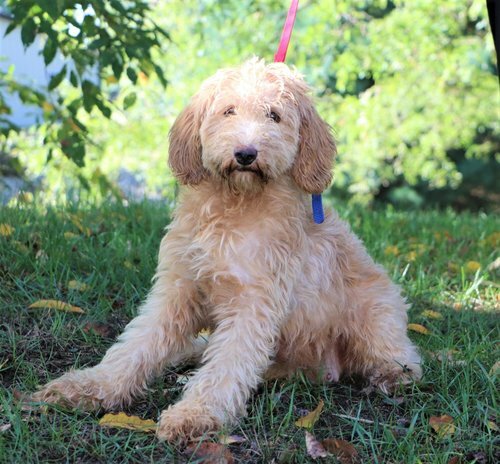 Nixon is a stunning Goldendoodle with a love for life. He loves to play outside and enjoys a good belly scratch. We are confident that he will be a great addition to any forever home. Neptune is a sweet little guy with a kind disposition. He embodies the kind and loving personality of a new puppy and we think he is absolutely gorgeous! His thick, soft, creamy coat will certainly receive many compliments. We know that Neptune will be a wonderful furry companion!